Please see the bottom of this post for the newest information. I was following the rumours on Twitter this (Saturday) morning in bed so I'll round up the highlights I saw. Please remember these are just reports from various complete strangers who happened to win lottery tickets to be at the stage event, so if some parts contradict others we'll have to wait for the official statements to clarify! Morikawa Toshiyuki (Kojuurou's seiyuu) showed up at the Saturday show. It seems that the main feature of the stage presentation was the debut of a brand new promotional video. Hopefully the rest of us can watch it in the next update to the official Sengoku Basara 4 website. Kojuurou's Sengoku Basara 4 gameplay movie appeared for the first time. 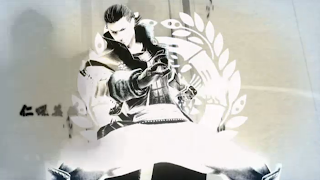 It shows Kojuurou's arrival, and then he fights Sakon with Masamune. Kojuurou and Masamune use their Giga Basara technique. The attendee wasn't sure whether the words that the characters shout when they activate their Giga Basara will change depending on the partner. They heard Masamune shout "We're going to show you our power!". The last battle was between Kojuurou and Hanbee; a fateful confrontation between tacticians. The Hanbee/Kojuurou fight was beautiful (as was Hanbee himself). His sword extended and wrapped around Kojuurou, but Kojuurou repelled it with his katana. There is some kind of team-up/alliance between the Date and Takeda forces. 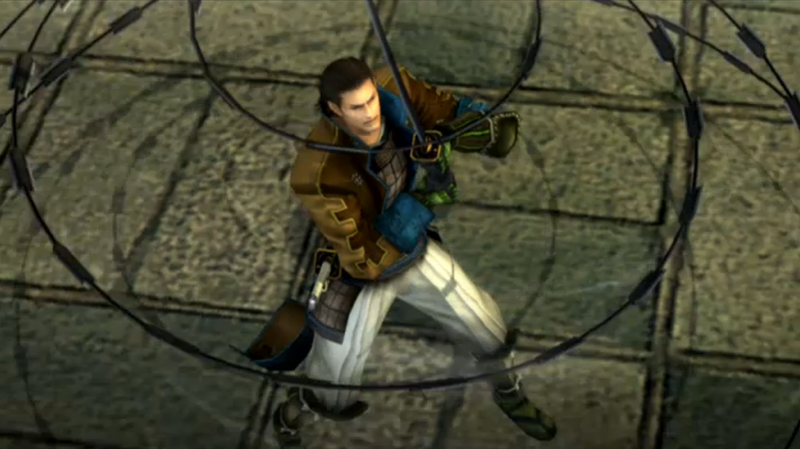 Someone thought they saw Katou Yoshiaki as a regular non-playable enemy in the crowd - possibly part of Sakon's forces. 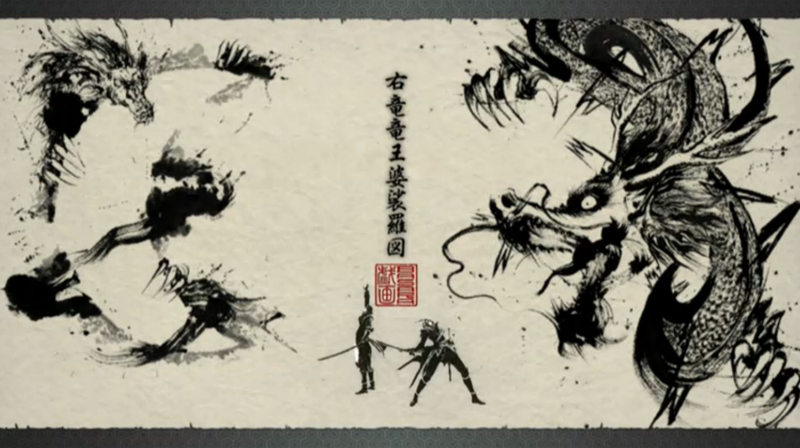 Kojuurou's Giga Basara ink painting shows a half moon. One person suggested there might be a dragon rising up at the back. 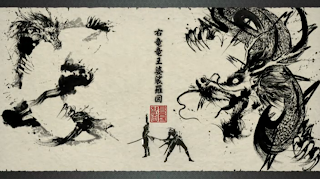 Mitsunari's Giga Basara ink painting symbolises falconry and tea, referencing the famous story about his meeting with Hideyoshi. 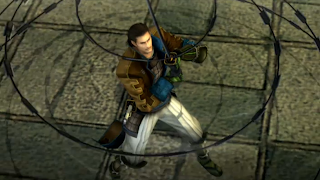 It was said that there are a large number of combinations of Giga Basara techniques, for example Kojuurou/Yukimura and Kojuurou/Hanbee. The tale of the roots of the 'twin dragons' (Masamune and Kojuurou) will be told in Sengoku Basara 4. The dialogues involving the young Masamune will be set before he becomes the head of his family. 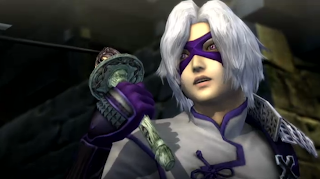 His seiyuu (Nakai Kazuya) tried his best with the voice of the young Masamune (Bontenmaru). YamaD said to look out for the sense that they're living in the same household but their master-servant relationship is not yet established. They played an awesome new song when Morikawa came on stage. The witness wasn't sure whether it might be a new piece of music for Kojuurou, and whether other characters might also receive new themes. Morikawa is interested in Oyassan (Shikanosuke's deer). He said "Are you prepared, Shika..!" at one point. Someone joked that they might run into one another after Oyassan digs up Kojuurou's crops while Shikanosuke is travelling around looking for Amago. Morikawa things the battle comrade feature is fun. Morikawa referred to Nakai Kazuya as Nakai-kun. When he plays the game at home he says things like "Hey, wait a sec, Nakai-kun" and "Gee, Nakai-kun...!". Another report phrased it 'the character everyone is worried about' will be appearing. Yet others specifically quoted KobaP as saying "I won't say who, but the character everyone is worrying about will appear." or "Please relax when it comes to whether that character will appear." or "People were saying that Kojuurou and Yukimura would probably not show up but there was no way they wouldn't appear! Please relax, everyone. Since they'll appear! But I won't say who!". 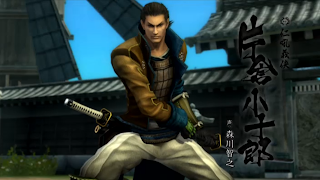 Fans who were there have suggested Ieyasu, Yoshitsugu, Motochika or Motonari might be that character depending on their personal biases. The Saturday show had YamaD going over the basics. On Sunday he's going to divulge more new information about the game. The Sengoku Basara 4 promotional tofu had sold out when one attendee went to buy some (hehe). It went on sale a second time in the afternoon and sold out almost instantly again. The organisers also ran out of the Date Masamune clear files which were part of the Akai Hane charity drive. The event had various flags on display showing the characters and a lot of posters from the Sengoku Basara anime. Apparently one of the members of CLAMP is a big Yukimura fan. KobaP supposedly had an exchange with one of them which went as follows: "I didn't think Yukimura was going to appear!" "Surely there'd be no way he wouldn't appear..." "I don't believe it! I don't believe Capcom!". If there are any new rumours tomorrow, I'll just add them to the bottom of this post to keep everything together. Also, I never mentioned this before but there are a lot of Sengoku Basara 4 posters in the Kyoto and the surrounding areas at the moment. They still don't show a firm release date other than the start of 2014. The Sunday event was apparently broadcast live worldwide on NicoNico, which is very annoying as I didn't know in advance and completely missed all of the announcements about it while I was asleep. It also means there's less information being retweeted since most people just watched it themselves. I'll be able to watch it in a couple of hours but here are the points I pulled off Twitter in the meantime. Someone took pictures of the Masamune/Kojuurou Giga Basara sequence and Hanbee. Hanbee's theme music has been rearranged. Update at 10:30 on 08/09/2013: Ok, I'm now able to watch the Timeshift version of the stage presentation on Nico Nico at last. I am already a Premium member on the Japanese part of Nico Nico so you might have to pay to see it if you use the English version. The Sengoku Basara 4 stage begins at 3:55:55 and the link is here. I'm still drowsy but I'll try to summarise the key points. There are pictures too. 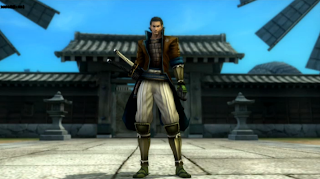 The presentation opened with the first Sengoku Basara 4 promotional video, then KobaP came on stage to introduce the game and announce director Yamamoto Makoto. There were no other guests. They then showed the promotional video again with some commentary from the two creators. They said the same kind of thing we've already heard in the magazine articles to bring the audience up to date, so the new material about Naotora was most interesting (she hasn't received a Dengeki PS article yet so YamamotoD's comments were new to me). Katsuie and Sakon are more like soldiers than commanders. Naotora's clothing is supposed to represent marriage, with veil-like frills and Japanese-style wedding imagery. Tokugawa Ieyasu is around in some form and in second place in Matabee's mark book, right after Date Masamune. Naotora challenges the Takeda by referring to them as "those stiflingly hot men" (Note: despite the way I phrased it in English this is not a compliment). The brand new Kojuurou play video was then shown. I took a few pictures of my own but the whole thing is even better - sadly the version on the livestream struggled with quality during the battle scenes. 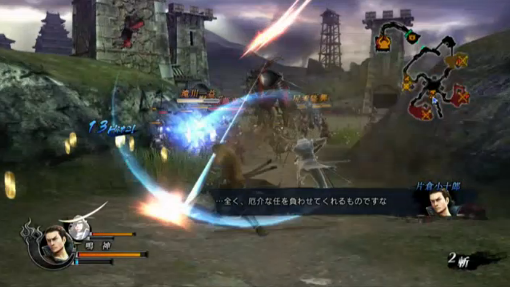 The battle scenes had some interjections by Katsuie, Sakon and the Toyotomi forces, and two bosses can be seen on the mini-map. It looks as though this stage involves disrupting a battle between the Oda (orange) and Toyotomi (red) forces? I could just about make out the pixellated names of some retainers like Katou Kiyomasa, Ukita Hideie, Katou Yoshiaki, Takigawa Kazumasu and Hori Hidemasa (so I guess that confirms they won't be playable this time around). The start of the Giga Basara technique. The climax of Kojuurou and Masamune's Giga Basara. Kojuurou's dragon looks cool. Hanbee compliments Kojuurou on deflecting his attack. There's still no release date. The creators then held a quiz for the audience with Sengoku Basara 4 posters as prizes. The first question asked for the name of Yoshiteru's 'restoring power to the heavens' order. The second asked for the name of the Giga Basara technique. The third asked which item Sakon possessed (dice), the fourth what kind of haircut Katsuie had, and the last asked who was accompanying Keiji in the new travel CD. One of the people who answered sounded really young. And after a brief news bulletin to advise the audience what they should be buying at the event, Yamamoto ran through a few more points. Naotora has a huge number of skills - perhaps more than twenty (some of these might be performed by holding buttons or something, they don't mean you can set them all individually as alternate special moves...). They're often asked whether Oyassan (Shikanosuke's deer) can talk. He can't speak Japanese, but he can speak 'deer language'. And that was all. The presentation was only thirty minutes long so there wasn't much time in between the videos and the usual audience greetings. I hope I didn't miss anything! If you ask me Keiji's a shoe-in to be that character. He's a poster boy, has been the centre of attention since Kyomaf started approaching and he's pretty much Kyoto personified in Sengoku Basara. It can't be Ieyasu since he's apparently the focus character in the next magazine, and you can't really reveal Motochika without Motonari and vice versa. The only other one who really has a chance is Yoshitsugu since he's pretty popular. I hope they clarify the statement (or just reveal who it is) at tomorrow's show. Keiji definitely seems to have the strongest claim. I also hope we'll get the video on Monday, though we might have to wait until the normal website update later in the week again. Maybe the young Masamune was trying to sound gruff all the time, and became uncannily good at it...my little brother can do a weird deep voice when he's trying to sound grown up (hehe). do you know if the trailer or more gameplay was recorded on the livestream? and was the stream even recorded? Mm, it didn't look as though Nobunaga/Hideyoshi were there in person, though we also know from last week's magazine that they have their own stages (Honnouji and Osaka: Toyotomi Hajou). The stage in the video didn't look like either of those, so assuming Mitsuhide has his own stage, Honnouji will only have Nobunaga and Katsuie lined up as bosses. I'd like to see Nouhime and Ranmaru in place guarding their lord at Honnouji - or even multiple versions again. The two huge warlords have to have at least two proper levels each, surely? Hi there. :3 I have a question, please. 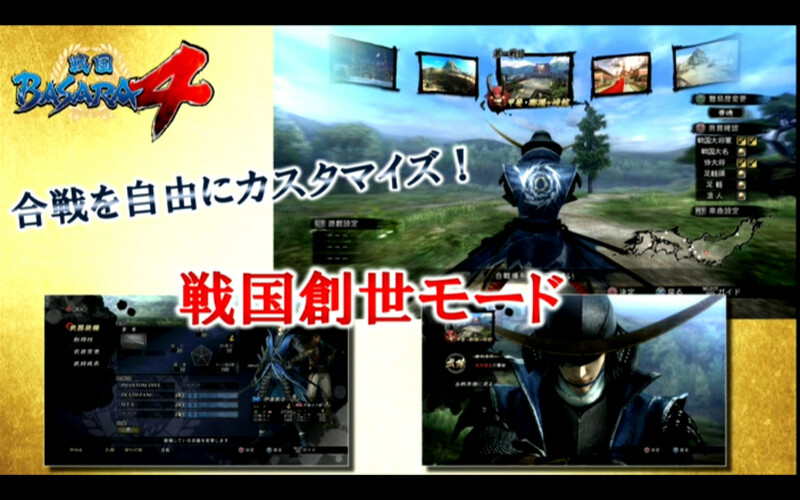 In the previous news, you said: " Masamune is shown with space for five skills along with three specials." It's hard to tell from the video but the picture in Famitsu was a lot clearer so I'll try to explain. The skill screen has four moves on the left and four on the right, with PHANTOM DIVE, DEATH FANG and JET-X shown and two ?? ?s (one at the bottom of the first column, one at the top of the second column). Then there are three lighter-coloured super skills which are all called ??? in the picture. They are numbered one/two/three in kanji at the side. Any word about the fact that we can or not use the 3 Super Skills as we wish on a stage? Switching between them as desired would be freakin' epic! Yeah, there's no official word yet but eagle-eyed people on a few fan forums have spotted that the special move name is displayed above Kojuurou's status bar like it used to be in the older games, so it's possible we'll see the old selectable specials come back again. I find it really difficult to choose sometimes so I hope it's true! Have they revealed who that character is yet?